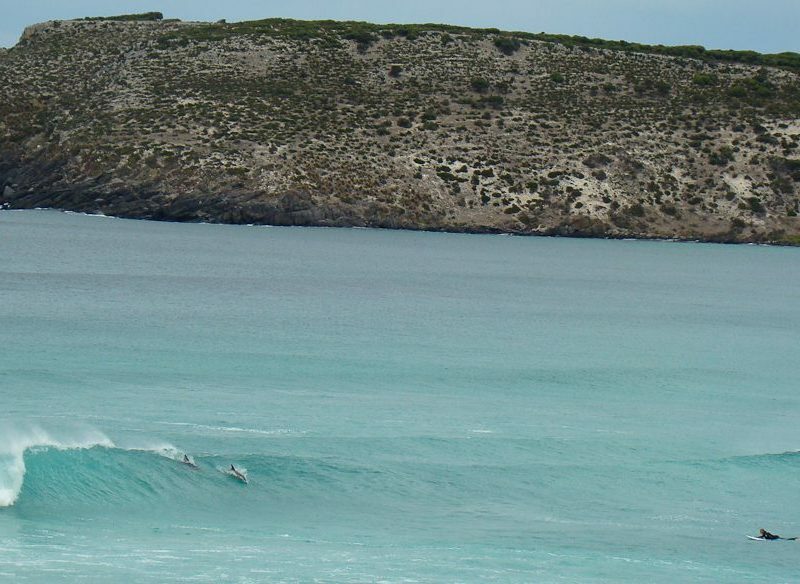 Dolphins power in to the break at Pennington Bay, Kangaroo Island. Australian Traveller reader Lucy Taylor packs up her extended family for a hands-on Kangaroo Island road trip, serendipitously stumbling upon pockets of fine food, art and action. My first mouthful of Kangaroo Island was chomped straight off the ferry which brought our car and us across from mainland Cape Jervis in South Australia, to pristine beachfront Penneshaw. As ropes were thrown to the jetty, dolphins leapt from the turquoise shallows, our first show of many over the next few days. A farmers’ market was set on the cricket oval in a laid-back kind of ‘swing’. A 10-minute wander around the market put me in the right kind of holiday mood; sourcing fresh local lunch fare was simple. We were in and out of the first stall with a handful of crusty bread, coated in Kangaroo Island’s Source Beetroot Relish and some fried sheep milk haloumi, both produced down the dirt track; topped with zesty rocket and a drizzle of the Island’s best olive oil. It is not unlike our home, Tasmania, the produce unique and tasty from the farmland surrounds. Only the yellow sun-parched ravines, bulging from the landscape, hint at another place, making these flavours uniquely dusted with that South Australian something special. The breath of the Southern Ocean bumping up against the limestone shore is different than at home, but the country vibe and finger-waving locals make us feel most welcome at our new island shores for the next six days. We are two car loads: mum, dad and the rowdy young boys who want to do a magical show charging two dollars every night; aunties and uncles, buns in the oven and grand nanny and grandfather. Took us a couple of ferries and a plane trip to get our load across to South Australia, but a sixtieth birthday celebration felt like the greatest excuse to get the crew together, on new shores. Surfboards and fishing tackle in the back, chooks and dogs offloaded to granny and pop left behind, and even the cat, accidentally locked into the house back in Tasmania for a couple of days survived our journey across oceans. A few swags were with us for a night under the stars and then a much-anticipated booking to the picturesque, hillside Kangaroo Island Beach Lodges. We were mixing family fun with a foodie festival. Beach combing with shark sighting. Luxury with laidback charm. Each day we encountered long stretches of road between the bays and farms gates, ochre-toned dust trails behind our discoveries. On day one we found a Ligurian bee population hard at work on Clifford’s Honey farm. The local mallee gum cleverly crafted into honey by the bees, tasted gamey and sweet. A new kind of flavour for each of us honey lovers, who finished off the experience with the creamiest little tub of ice-cream made on site. We all sat with tight seatbelts and sweaty armpits on this sunny day, as we rumbled down the track to the next stop. Our morning toast, a whole new kind of yummy every morning thereafter. 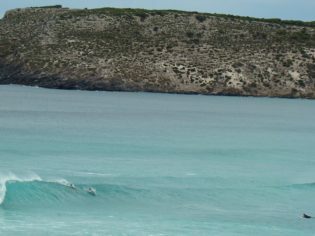 On day two we surfed with dolphins and a school of trevalla. Possibly even a shark. It is hard not to imagine every dark shape framed by a stunning clear aqua blue is a great white with seal colonies dotting the south coast of the island, where the swell rolls in on our stay. The waves are first class, and while the Bells Beach Classic gets top coverage over the Easter weekend down in Victoria, Pennington Bay is arguably where the best action is at. Dolphins drop into four foot ‘pits’ and grandfather pulls into a barrel before his son in-law with his finned friends not far away. On the beach pregnant aunty belly flops in the dumpers and young sons wheel around like gulls, collecting cuttlefish and feathers from great sea eagles in the limestone soft sand. On day three we have South Rock roast lamb for dinner, literally out of our front paddock, as we are staying on the sheep farm in a self-contained shack at Antechamber Bay. The Kangaroos peer in at us, glad that it is not them on the dining table, despite one of the youngest lads in the travel party doing their best to install a stick trap using old reams of fishing rope found down on the farm’s own shorefront where we fish and walk at sunset, to catch a boomer to no avail. On day four we meet a local artist and traipse Fine Art gallery in Kingscote. Our art-loving family is inspired. Grand nanny pulls out her acrylics and canvas sheets and we are each ‘ordered’ to paint an image inspired by our island stay. Some pieces are more “Shep”, others Jenny Clapson; two local favourites. Our migrant artists paint architecturally pleasing, solar passive buildings, ocean shadows, sea eagles and cars parked at the surf break with some gnarly left-handers in ultramarine brush strokes. We each pull out some good lines for our artist statement for a sixtieth birthday exhibition to be held on the final evening at our luxury accommodation. On day five, we spend all our spare change on hiring sand boards and locating Kangaroo Island’s very own ‘Little Sahara’, complete with high peaks and pocketed beeswax cubes that rubbed strategically in the right places on the deck make a downhill descent dangerously speedy. Each of us had a sore spot, underpants full of salt grains and for one of us, completely facial exfoliation; a whole head having been submerged full speed into a mound of sand. On day six we eat a local catch of King George whiting marinated in lime juice, coriander, salt, pepper and local olive oil with a spud salad and greens and sip local sauvignon blanc from Dudley Wines on the Island’s east coast. Some skull a fine Coopers ale. We all line a long table at our lodge overlooking our own private paradise, and a farm of 800 hectares. It is a busy time to visit the Island at Easter and yet it’s hard to imagine there is another person here. It feels quiet, calm and peaceful. Kangaroo Island is known by the aboriginal descendants of this place as ‘Karta’, land of the dead and in a way it is heavenly visiting here in holiday mode, like all the perceived busyness of normal life does cease to exist. Our hospitable accommodation provider at Antechamber Bay mentions that one of the first settlers, post colonisation sailed to Tasmania to find a native wife (many sealers may have done the same in an earlier time); he brought her back to the land we stayed on; … Our island populations converged. “So you have a connection here”, he says and it is easy for us to feel that way though our time here is fleeting. Flights are available to Kingscote, the capital of Kangaroo Island flying Rex from Adelaide. Sea Link is a ferry service running several times daily from Cape Jervis on the Fleurieu Peninsula, to Penneshaw on Kangaroo Island. Mainland coach connections run from Adelaide and Goolwa to connect with SeaLink ferries. On island connections are also available to pick up and drop off at accommodation on the island. Kangaroo Beach Lodges are suitably equipped to sleep up to 8 adults (and a couple of kids) in luxurious, architecturally stunning accommodation with your own private beach. Gateway Visitor Information Centre at Penneshaw (08) 85531185 or free call 1800811080 is a great source for accommodation and ferry bookings. It is best to have your own wheels. A four wheel drive is recommended to traverse all the gravel roads that will lead you to some of the best farm gate experiences and beaches around the island. On-island connections via coach and hire cars are also transport options on Kangaroo Island.